For those caught in the hell of compulsive hand-washing, checking the locks of doors, and hoarding – some of the behaviours associated with Obsessive Compulsive Disorder – half a million of them in Australia – relief may be on the way in the form of deep brain stimulation, involving a pacemaker implanted in the brain. According to a paper published in Science on Friday, US neuroscientists have shown that they can block compulsive behaviour in mice by activating a brain circuit that controls compulsive behaviour. They did so by using two groups of mice. In one they knocked out a gene called Sapap3 that inhibits compulsive grooming behaviour, the equivalent of human hand-washing. The other group of mice were not tinkered with. Both groups were put through Pavlovian-style conditioning where a musical tone sounded a few seconds before a drop of water plonked them on the nose, triggering grooming behaviour. If this sounds harsh, some therapies with OCD patients involve this kind of conditioning. After several hundred drops of water on the nose, the normal mice wised up and ignored the musical tone, waiting for the water to fall before grooming. This type of behaviour is called optimisation, which basically means conserving energy. The genetically deficient mice, however, continued to groom whenever they heard the tone, suggesting they had become hostage to compulsive behaviour. The researchers, from the Massachusetts Institute of Technology, believed these compulsions were caused by failed communication between the striatum – a part of the brain responsible for addiction, repetitive behavioural problems, and decision-making – and the neocortex, which controls motor commands (stop picking your nose), conscious thought and language. The mice were then further fiddled with – where cells in the neocortex and the striatum were made sensitive to light. When the cells were stimulated with light signals, the mice stopped their compulsive behaviour. When the gene-modified mice were light-stimulated during their regular grooming, the behaviour dropped away. This therapy is a new technique known as an optogenetic intervention, a therapy that has not yet been developed for human consumption. Eventually, a pacemaker could be developed to send light signals that would quell compulsive hand-washing. That means OCD sufferers would have to be reminded to keep themselves nice, like everyone else. Until such time as the brain pacemaker is available, sufferers would be advised to order a copy of “Brain Lock”, widely considered the best advice on using the power odour own minds to defeat this awful “trick” that our brains can play on us. 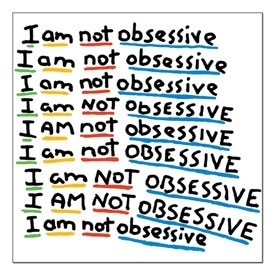 Above all, do not give in to the anxious hell that is OCD – never despair that you will not get well – the illness can – and is – defeated by thousands of people every day. Does the book have also methods to reduce re assurance seeking and constant worrying ? Essentially, as I understand it, most anxiety responses are the same – just different symptoms according to conditioning and part of the brain firing off. The solution is always the same – a combination of anti anxiety meds, exercise, good diet, deep breathing, and positive psychological support, such as Cognitive Behavioural Therapy. Australians and coincidences and wine and barges. And history. And that sort of stuff.